The top and bottom lines of the rectangle are the 3rd and 1st quartiles (Q3 and Q1), respectively. The length of the rectangle from top to bottom is the interquartile range (IQR). The line in the middle of the rectangle is the median (or the 2nd quartile, Q2). The top whisker denotes the maximum value or the 3rd quartile plus 1.5 times the interquartile range (Q3 + 1.5*IQR), whichever is smaller. The bottom whisker denotes either the minimum value or the 1st quartile minus 1.5 times the interquartile range (Q1 – 1.5*IQR), whichever is larger. You can confirm some of these numbers by calculating the five-number summary with the summary() function. *This following 5-number summary has been changed from a previous post. Please read my comment at the end of this post for an explanation on why this was done. In this example, the bottom whisker is the minimum value, 1. The maximum value (168.0) is not the top whisker because it is larger than Q3 + 1.5*IQR. Here is the code for plotting the parallel box plots with the labels of the cities using the ‘names‘ option. 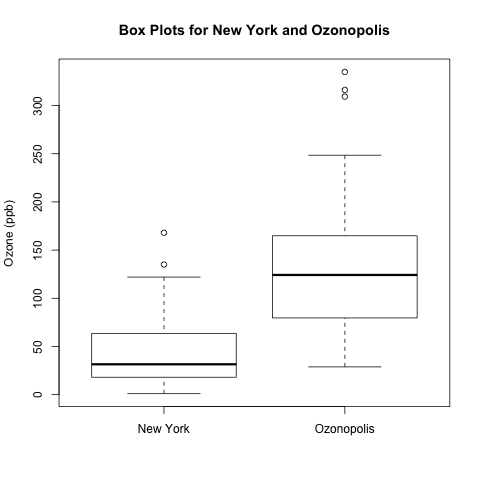 These box plots suggest that Ozonopolis has significantly more ozone than New York; not only is the centre higher for Ozonopolis, but the 2 IQRs (the 2 rectangles) do not overlap along the vertical axis, suggesting that the 2 population means differ beyond just random variation. To quantify this difference, you can use an independent 2-sample t-test, which I described in detail in a previous post regarding the discovery of argon by Lord Rayleigh and William Ramsay. I prefer this above vertical orientation of the box plots, but it is possible to arrange them horizontally by specifying horizontal = T. Be sure to change ylab = ‘Ozone (ppb)’ to xlab = ‘Ozone (ppb)’. There is another way of specifying the axis labels in R, but it requires calling a separate function called axis(), and it requires different syntax for horizontal and vertical box plots. xaxt = ‘n’ in boxplot() suppresses the x-axis labels that come with boxplot(). The first argument in axis(), “1“, specifies that the axis labels go on the bottom; see the documentation for further details. A nice addition to add to box plots is notches. According to Chambers et al. (Page 62, 1983), the 2 medians are significantly different with 95% confidence if the notches of 2 box plots do not overlap. 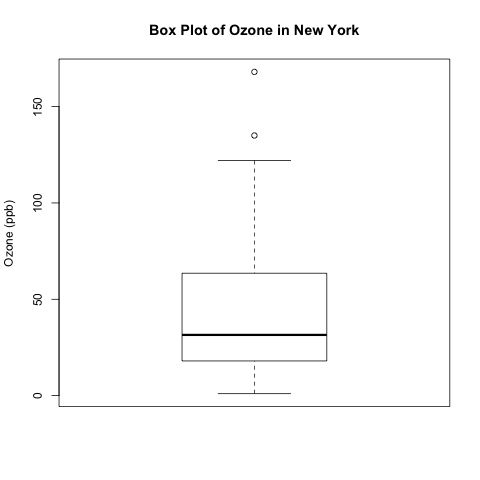 Let’s plot the box plots with notches for our 2 cities’ ozone concentrations. 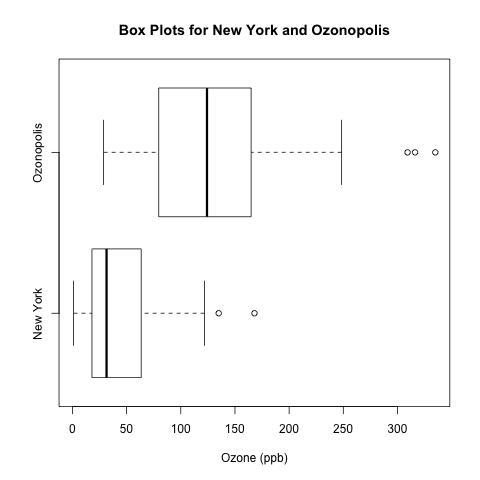 As you can see, the notches for the ozone concentrations in New York and Ozonopolis don’t overlap, so there is strong evidence to suggest that their medians are significantly different. 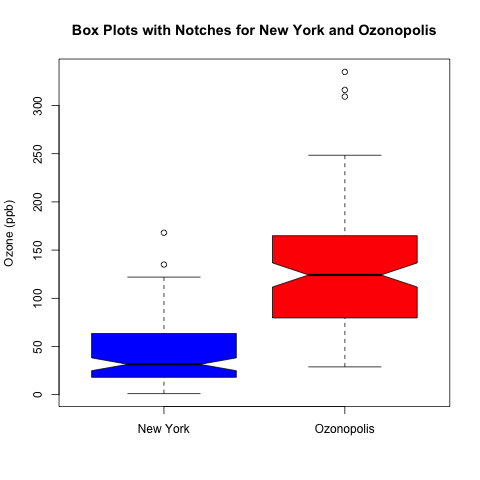 Box plots are simple but effective tools for data visualization. In a future post, I will talk about kernel density plots, and I will introduce a type of box plot that incorporates a kernel density plot. Kabacoff, Robert. R in Action. Manning Publications Co., 2011. Here is a reference you might be interested for more variation of the boxplot in additional to the violin plot you have mentioned. Thanks for this paper, Michael! Those box plots look very cool! In a previous version of this post, the 5-number summary was calculated using summary(fivenum(ozone)). This resulted in a problem and a discrepancy. – The problem is that the mean is wrong. summary(fivenum(ozone)) gives the mean as 56.4 when it is actually 42.13. – The discrepancy arises from the difference between the 3rd quartiles of 2 different methods in R. summary(fivenum(ozone)) gives a 3rd quartile of 63.5, while summary(ozone) gives a 3rd quartile of 63.25. I raised this question in a discussion in the LinkedIn group “R Programming” entitled “5-Number Summaries in R”, and I encourage you to read the discussion for more clarification. I thank Marco Biffino and Mukul Mehta for their contributions to that discussion. I have changed this post so that it now uses summary() to get the correct mean and to be consistent with the post on descriptive statistics. I thank David Maxwell and Allan Reese from the Centre for Environment, Fisheries and Aquaculture Science in Great Britain for noting and explaining these issues in personal emails with me. Sorry, I’m confused. How to get ozone2? Good for you for noticing this omission, and thank you for pointing it out! I have updated my blog post to explain how I simulated it. I may be wrong, but is there any interpretation of the width of the boxplot. I am new to the data analysis/statistics and still in the learning stage. So my question could be meaningless. No, there is no meaning to the width of the box plot along the axis that denotes the name of the data set. Thanks a lot Eric for quick reply. I have couple of questions. If you have time to reply or write a post in your blog on the following questions, that would be great. 1. How to handle lots of missing values in a very large dataset ? 2. How to sample a smaller data set from a very large dataset (e.g 204000 x 150) with lots of missing values ? 1) You are not specific in what you mean by “handle”, so I presume that you mean to extend your question about box plots for missing values. Unfortunately, there is nothing that you can do to account for missing values in a box plot. It is worthwhile to note the number of missing values in any exploratory data analysis. In R, the summary() function will show the number of values coded as ‘NA’, which is the usual coding for missing values. 2) This is a good question. I am not an expert on missing data, so I am not the best person to answer this question; I welcome others to contribute their ideas! I will definitely consider researching this issue and writing a blog post about it. This is a nice blog by Eric Cai. Specially for those who are new to statistics/data analysis. Thanks for re-blogging my post, duttatridib! I’m glad that you find my blog to be useful! Thanks for this. BTW, mean.ozone and var.ozone are not defined here. They are defined in another post, but it may not be easy for readers to find. Thanks for noting this omission, detaildevil. I have updated my post to define them! The top whisker does not really denotes the maximum value or the 3rd quartile plus 1.5 times the interquartile range (Q3 + 1.5*IQR), whichever is smaller. The most extreme data point which is no more than range (in your example 1.5) times the interquartile range from the box. A value of zero causes the whiskers to extend to the data extremes. This means, that if your vector (in the example, ozone) would not have any value equal to Q3 + 1.5*IQR, the whisker would extend to the immediately below value in your vector. If your vector does not have any 131 value, the whisker would extend to maybe 120 or 100 depending which is the immediately below value in your vector. Using your code for ozone2, I get an error message as object n is not found. what should this be? Thanks for noticing this error, Anne. I’ve corrected my post to remove the missing values at the beginning and then obtain the length of the data vector before creating “ozone2”. great, thanks Eric! Excellent site, thanks so much! Thank you for your input, Anne!